Warrior King Legacy – one of the best books we’ve read this year. It’s an interesting life, being an editor. You get to read people’s work, long before the general public ever see it. Sometimes, it’s your job to tell an author the work is not ready for the general public yet, sometimes you enjoy a book and suggest tweaks that could make it work more effectively…and then, just occasionally, you get to read a book that makes you want to start a publishing company, just so you can get more people to read it. 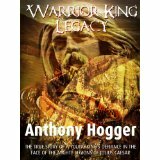 Anthony Hogger’s Warrior King Legacy, published this week on Amazon, is one of those books. The book is a historical fiction masterpiece, telling the story of Vercingetorix, King of the Gauls in the time of the expansion of the Roman Empire. Warrior King Legacy blends a story of fathers and sons and the expectation of greatness thrust on a child with philosophical concerns of relevance even today – what do you do if the greatest superpower in the world wants to take your land, your resources, your way of life? Vercingetorix chose a destiny in opposition to the might of Rome, and forged the disparate and distrusting tribes of Gaul into a single, unified nation, then pitted his skills against the armies of the Empire. The armies lead by Julius Caesar. In a clash of destinies where only one can be victorious, Warrior King Legacy shows Vercingetorix the man, behind the trite descriptions in Caesar’s own account of the Gallic Wars. It shows a man equipped for greatness, powered by self-belief and the legacy bestowed on him by his father, and how he founded a nation the world will never forget. Warrior King Legacy is a book so good that we at Jefferson Franklin read it twice during the editing stage – and immediately bought it for the pleasure of reading it again when it was released. Immerse yourself in the world of the Gauls today – Warrior King Legacy is at Amazon now.